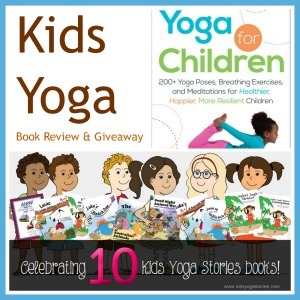 This is week #10 in our 10-Week Kids Yoga Resources Reviews and Giveaways. Join us next week for the Mega-Giveaway Finale. 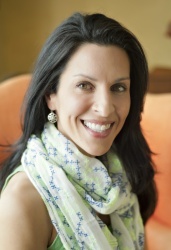 As a parent and former teacher, I have the distinct pleasure to introduce you to Lisa Flynn, founder of ChildLight Yoga and author of Yoga for Children. Besides being an amazing author, Lisa Flynn is a beautiful soul who does amazing work with ChildLight Yoga and Yoga 4 Classrooms. Definitely check out her resources, teacher trainings, and workshops. I love practical, inspiring, research-based, and user-friendly books written by experienced, passionate authors. 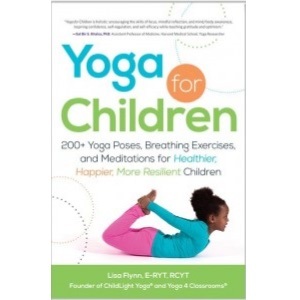 Flynn’s Yoga for Children is one of my go-to reference books for kids yoga. Many of you ask about how to get started with practicing yoga with children. Well, here’s the perfect book! The overall layout has bright colors and professional photographs of children demonstrating the poses. Its comprehensive introduction debunks myths about yoga and presents research-based benefits of yoga, age-appropriate expectations and activities, and suggested props. The list of yoga principles is written in clear, meaningful language, with related books and activities. The ten tips for successfully sharing yoga with children are fantastic, making it a perfect resource for yoga beginners or experienced practitioners. It offers tools to connect and bond with your children in fun, playful ways. The practice is presented as creative, accessible, and holistic. Flynn details the tenets of yoga, including meditation, breathing techniques, physical postures, family yoga, games, songs, chants, and relaxation. She provides practical advice on how to create a yoga practice for your family that is either five minutes or one hour long so that it suits all families who would like to share the joy of yoga with their children. Sample sequences get you started with poses, including the benefits, what to do, and what to say. I couldn’t agree more with Lisa’s comments about the benefits of yoga and story. Photo from ChildLight Yoga website. 1. Entries are open to Canadian and United States addresses only. 7. Kids Yoga Stories and ChildLight Yoga accept no responsibility or liability for any injuries or losses that may result from practicing the yoga poses in the books. Please ensure your own safety and the safety of the children. 8. You must enter the contest giveaway with a valid e-mail address. The winner will be notified by e-mail, and at that time, we will request a mailing address. The shipping of the books can take some time, depending on the winner’s location. 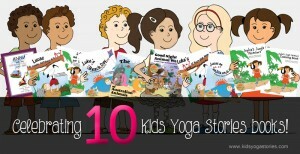 Kids Yoga Stories and ChildLight Yoga will ship the books separately and will cover the shipping costs. 10. The contest closes on Monday, December 9th, 2013, midnight EST. Want to be notified of other reviews and contest giveaways? Sign up for our weekly Kids Yoga Stories Newsletter (put name and email address into box at the top of the page) to get updates of the upcoming weekly giveaways! I am actually super excited about integrating yoga into my holiday this year. My husband is a musician. We will be teaching a Candlelight class and he will be playing the acoustic guitar in the background!! I had a baby almost 6 weeks ago so for the holidays I’m hoping to ease back into a more regular practice. I’m trying to take out moments in my day to take more deep breaths and practice gratitude. Looking forward to using this book to gain more ideas for fun yoga sessions this Xmas as the neighborhood kids come over and learn about yoga! I will use it to integrate into a children’s yoga class and also practice with my little ones at home to create the holiday season. I would love to get my kids into the habit of doing a little yoga every day during Christmas Break. Maybe we can make it a habit before they go back. Thank you all for these giveaways! Apart from books, I feel like you are also giving love and light and peace, spreading the philosophy of yoga to the whole world! And when yoga is combined with children, the result is really magical!